At the same time he agreed to give up the representation of many of his supporters in the three Oconee County precincts that will be lopped off the northern part of the county to be transferred to a new district created for Rep. Doug McKillip, now representing Clarke County in the legislature. The exact nature of the new district and the challenges facing Williams are made clear by a map of Clarke County that Williams made available to me on Friday. It also shows that the portion of Oconee County assigned to the 117th follows existing precinct lines, meaning that all of the precincts of Athens Academy, Malcom Bridge and Bogart will go to the 117th. At present, all of Oconee County is in the 113th District, which Williams now represents. His home on Old Watson Spring Road in the southern part of Oconee County is in the new 119th. The House voted on Thursday to approve the new districts, with both Williams and McKillip voting in favor. The plan now goes to the Senate. The Senate also approved its redistricting plan on Thursday and sent it to the House. Sen. Bill Cowsert, representing the 46th Senate District, voted in favor. Oconee County falls entirely within the old and new 46th District. Clarke County gave up precincts and Walton County added precincts to form the new 46th. Historically, each chamber has simply approved the redistricting plans of its alternate and sent them to the governor for a signature. Among the prominent supporters of Williams in Oconee County who will be shifted to the 117th is Larry Benson, Williams’ campaign treasurer, who house on Tanglebrook Drive is in Athens Academy Precinct, whose Springhill Suites hotel on Daniells Bridge Road is in Malcom Bridge Precinct, and whose bakery in Bogart is in the Bogart Precinct. Williams also will lose supporter Hank Huckaby, who resigned from the 113th House District seat in April to become chancellor of the University System of Georgia. Huckaby’s resignation necessitated the special election in June and runoff in July that put Williams in his current position. Huckaby’s resignation also left Oconee County unrepresented and vulnerable as the Republicans in the House and Senate drafted their plans for the new districts. Parties that control redistricting–in this case, the Republicans–seek to avoid drawing lines that result in incumbents in their party running against each other. Huckaby, McKillip and Williams are Republicans. So it is highly unlikely that Oconee County’s Athens Academy precinct, in which Huckaby lives, would have been switched to McKillip’s new district had Huckaby wanted to retain his seat. 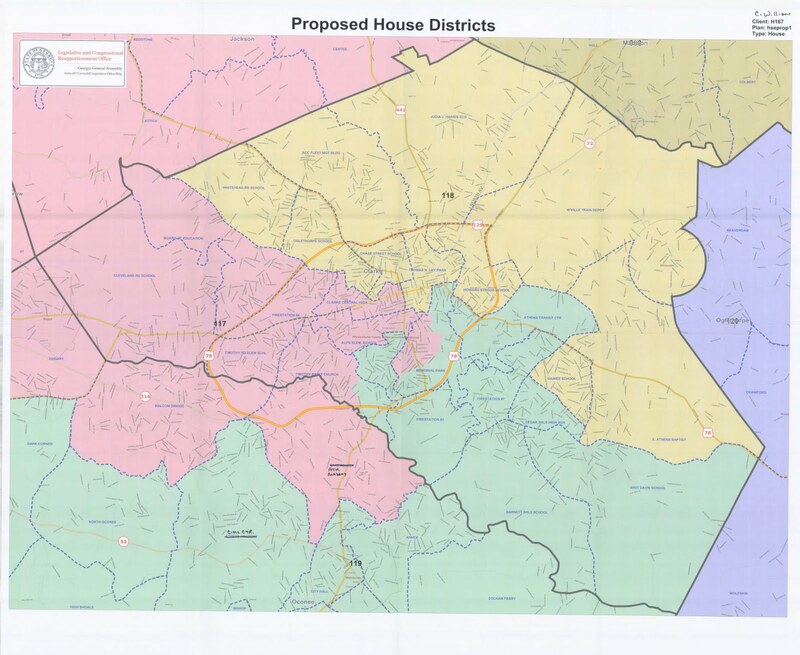 Williams said at a town hall meeting organized by the Oconee County Board of Commissioners on Tuesday night that he had not seen the redistricting plan until it was released to the public on Aug. 12. He said he had seen one earlier proposal that had cut Oconee County up even more. The House and Senate Reapportionment Committees released gross maps of the districts on Aug. 12, before the General Assemble convened on Aug. 15 in the special reapportionment session. The Committees also released a Google Map on which the district lines had been overlaid. I matched those district lines with maps of Oconee County and Clarke County precinct lines last week and posted a story on Wednesday outlining the characteristics of the 117th and 119th districts. 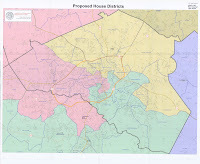 I live in the Athens Academy Precinct of Oconee County, and I sent email messages to Jimmy A. McDonald, executive director of the Legislative and Congressional Reapportionment Office, and his assistant, Tonya Cooper, early last week asking for copies of the maps for the 117th and 119th districts. I followed with a phone call, and Ms. Cooper told me that the office had been swamped by requests and is trying to catch up. On Friday I asked both McKillip and Williams for help, and Williams offered to let me have his only copy of a map, which shows those parts of the 119th in Clarke County. Williams told me he also had difficulty getting the map himself because the redistricting office was overwhelmed with requests. The map he gave me contains errors in two of the Oconee County precinct names. Williams corrected those before he gave me the map on Friday. The map I scanned contains those corrections. The media coverage in Oconee County during the past week has focused mostly on the partitioning of the county in creation of the two House districts. Oconee has been in the same district only since 2004, and other counties throughout the state also have been divided into more than one district. Hall County is divided into seven districts, though one of them–the 29th--is entirely in the county. The population of the state of Georgia, according to the 2010 Census, is 9,687,652. The state has 180 House districts. So the ideal size, to reflect the principle of one-person one-vote, is calculated by dividing the state population by 180, resulting in the goal of 53,820. The ideal size for one of the 56 Senate districts is 172,994. Oconee County has only 32,808 residents, so it has to be combined with other counties to create districts of an acceptable size. The current 113th House District was created by combining Oconee with parts of Clarke, Oglethorpe and Morgan counties to create the ideal size based on the 2000 Census. The key issue for Oconee County most likely is not that it will be partitioned but that it no longer will be a majority part of any House district. Nearly six in 10 of the registered voters in the current 113th District live in Oconee County. In the new 119th, Oconee County voters make up only half of the total. It is not hard to imagine a situation in which no representative living in Oconee County is in the Georgia House of Representatives. And Clarke County could easily have three. The new 119th is made up only of Oconee and Clarke residents, while the new 117th will have voters from Oconee, Clarke, Barrow and Jackson counties. The 117th has no core, though Clarke will be dominant and one might imagine a core built around the commercial hub of western Clarke and northern Oconee counties. The old 115th, which is replaced by the 117th, was entirely in Clarke County, as was the 114th. The 114th becomes the 118th, and it alone among the three new districts will be made up solely on residents of one county. The new districts for Oconee and Clarke counties clearly are more interdependent and regional than the old ones. The three new districts also differ from the old in two other important ways. Republican voters are allocated differently, as are, to a much less extent, African-American voters. Both the new 117th and 119th are made up of voters who gave 54 percent of their votes to Republican Gov. Nathan Deal in the three-way race for governor in 2010 and 59 percent and 60 percent of their vote respectively to Republican Johnny Isakson in the three-way U.S. Senate race that year. The old 115th and 113th, which are replaced respectively by the 117th and 119th, gave 38 percent and 62 percent of their votes to Deal in the three-way race. And they gave 43 and 67 percent of their vote to Isakson. Voters in the new 118th voted 29 percent for Deal and 32 percent for Isakson, while voters in the 114th voted 28 percent for Deal and 31 percent for Isakson. In the new 117th, African-Americans make up 16 percent of the registered votes, while in the 115th they were 17 percent. In the new 119th, African-Americans make up 10 percent of the registered voters, compared with 9 percent in the old 113th. In the new 118th, African-Americans make up 35 percent of the registered votes. In the old 114th, they made up 37 percent. The reapportionment committee released the data on the new districts but nothing about the old. I obtained the registration data for the old districts from the archives of the Georgia Secretary of State. I computed the vote percentages based on data also taken from the Secretary of State archives. The vote figures are approximations, since the archives do not report election data broken down by House district except for the election of House members. The 113th and 115th split one Clarke County precinct, and the 113th and 114th split one precinct. Precincts in Oglethorpe and Morgan counties that were part of the 113th also were split. I have created a table that summarizes the calculations I did and put them on Box.net. The calculations are carried out to one decimal point in the table. The table also shows some additional data on race of the population of the new 117th, 118th and 119th districts. These are Census data, and no comparable data were released for the old districts. African-Americans are 18 percent of the new 117th District, and Hispanics are 8 percent. African-Americans make up 34 percent of the 118th District, and Hispanics make up 15.2 percent. In the new 119th, African-Americans are 12 percent, while Hispanics are 4.3 percent. The new 117th district was created to accommodate Rep. McKillip, who was elected in 2010 as a Democrat but switched to the Republican Party before the legislative session began in January. As the map shows, the new district jogs to pick up the home and neighborhood of McKillip so he would not find himself in competition with Williams for the 119th should both decide to run in 2012. McKillip lives on University Drive. Both the 117th and the 119th would seem to be relatively safe for Republicans. The party affiliation of voters in Georgia, however, is hard to assess, since voters do not register by party. A tendency to vote for a party in the future has to be inferred from past elections, such as those in which Republican Deal defeated former Democratic Governor Roy Barnes and Isakson defeated Democrat Michael Thurmond. The Gallup public opinion organization, which asks respondents to its surveys to classify themselves by party affiliation, reported that data from across surveys in 2010 showed Georgia with 16 percent of its population classified as independents without any inclination to either of the two parties. The two parties nearly evenly split the remainder of the voters. Data for 2011 will not be released until early 2012. Third party candidates also make it difficult to predict what happens when those parties do not run a candidate, as in local House and Senate races. Libertarian John Monds got at least 5 percent of the vote in the gubernatorial race in each of the three new districts, and Libertarian Chuck Donovan got about 3 percent in each. Those kinds of uncertainties might cause newly elected candidate Williams from the current 113th House District to think back on his vote and that of his Republic colleagues as the 2012 elections draw closer.